An Unexpected Pairing | Hello Delicious! Squeezing one last post in for 2014. I’d love to resolve to post more in 2015, and who knows maybe I will. But let’s be reasonable. 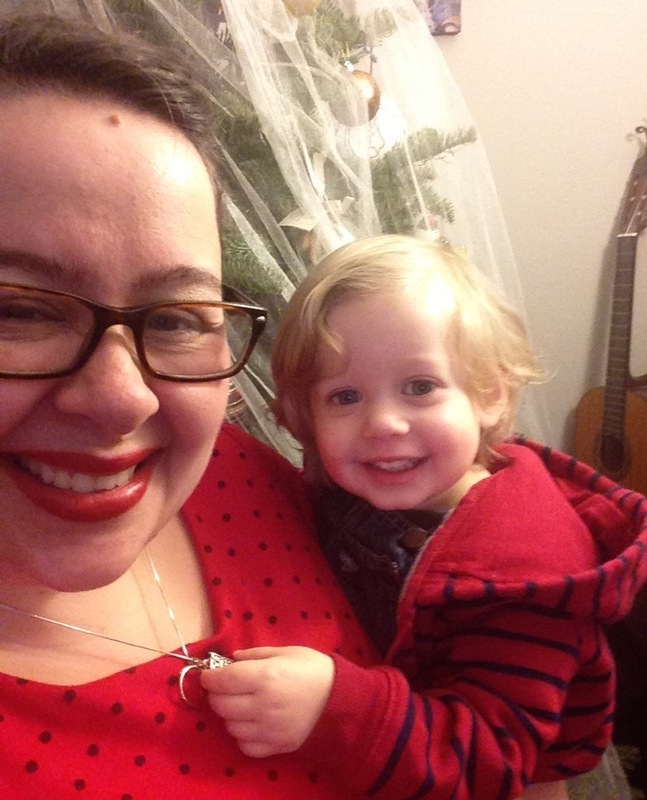 With baby on the way and toddler life in full swing I can only imagine that my productivity will be fairly similar to what it is now, if not a little more stifled. That said, I’ve got one more offering for the year. Actually – my wonderful husband has one more offering for you this year. Sure, I’m posting it, but he gets all the credit. All of it – and it’s delicious. I can only take credit for posting it because I woke up the other day and couldn’t stop thinking about it, and how much you need this recipe in your life. It’s a bit of an unexpected pairing, but just works so beautifully that you can’t deny how awesome the resulting marriage of the unique ingredients is together. Story time :) When Ty and I were dating we were sometimes mistaken for brother and sister. Not necessarily the first thought I wanted associated with the guy I was kissing and holding hands with at the movies, but the resemblance was kind of hard to deny. I mean seriously, how adorable were we? Just to confirm said adorableness. I know biologically speaking it’s not uncommon that we are attracted to each other. Similar face shapes, the amount of space between our eyes, the width of our mouths – it’s like looking in a mirror, which I guess makes sense. We even sort of dressed alike most of the time – comfy and casual. We even both have glasses now. It’s funny to me when I start drawing all the comparisons, but not because they’re necessarily funny things. 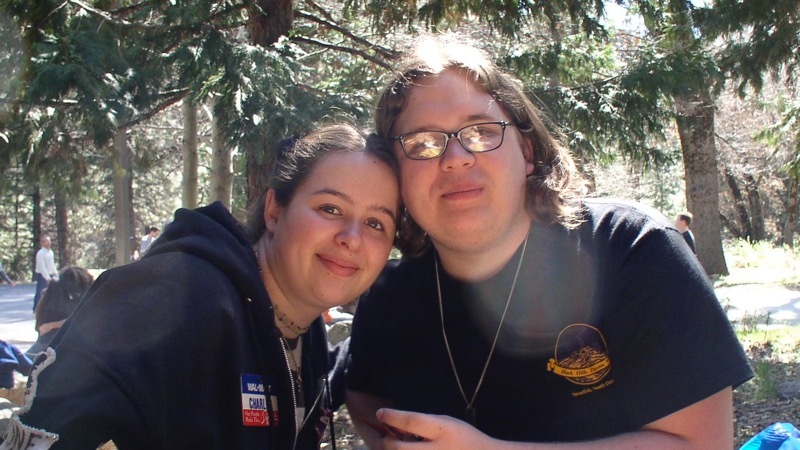 I’m more often than not struck by how different we actually were/are. He used to hate the music I listened to in the car. I admit that my tastes were (and still are) fairly eclectic, but it was one of the first things we argued about. Timing was an issue for us too sometimes. I’m very organized and scheduled (a bit type A), where he tends to be more go with the flow. He is a gifted musician who’s best subjects in college were in the arts, and I found my success in literature and science classes. 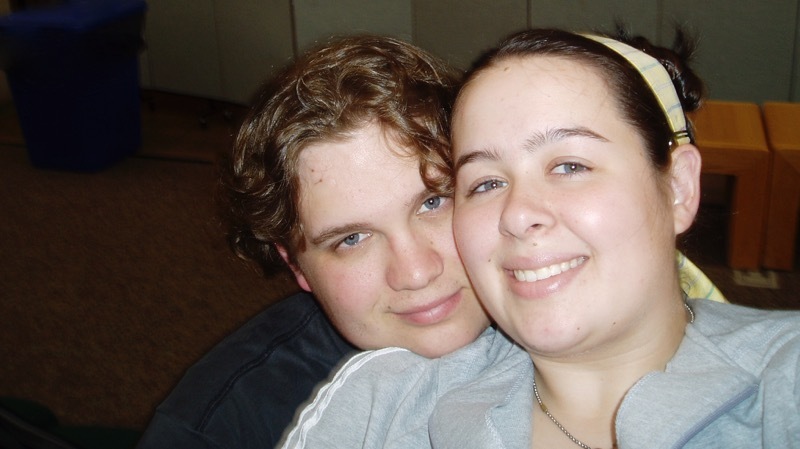 I’ve played the piano since I was 6 years old and can sightread just about any piece of music with some proficiency, whereas he nearly failed his college piano proficiency exam (it’s a hilarious story – ask me about it sometime!) even though I love listening to him create music on the piano. Scales and structure just aren’t his thing, and I really have trouble just winging it (I don’t/can’t jam). In our marriage I’ve seen these same similarities and differences come out all over the place. The kitchen is definitely one of those places were I see the differences pop up. I excel at structure. I’m that nerd that reads recipes for fun. No joke – I’ve curled up on the couch with a cookbook in hand before just to read recipes and techniques. I like when things work together in an exact and precise way. Ty’s strengths lie in being able to put things together kind of on the fly. He tastes as he goes, and generally just has a feeling for what works well together. He can also follow a complicated recipe with excellent results, and I can cobble something tasty together with the knowledge I have about different foods, but I think we’re both more comfortable in our own elements. We’re different, but we work together very well. I know it’s fairly common knowledge that opposites attract, but it’s still amazing to think how two absolutely different pieces make a complete puzzle. This recipe is a bit of an approximation, and if you’re having lots of people over you can easily add more ingredients as you see fit. This will make a nice big bowl, and it tastes great with some salty corn chips! Look at that bowl of colorful deliciousness. Don’t you want to just devour it all? But first, you have to make it! Simply combine your tomatoes, onion, garlic, cilantro, a good squeeze of lime juice, and a sprinkle of salt in a big bowl and set aside. The amount of lime juice and salt you use is really up to you. 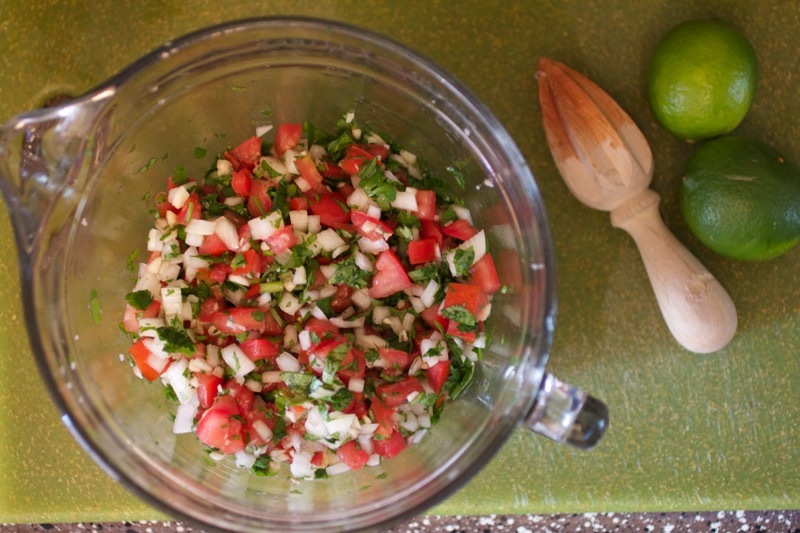 Make sure you taste as you go – it’s a simple pico de gallo and you really can’t go wrong. Slice your avocados in half, remove the pits, and simply do a criss-cross cut before scooping the flesh out with a spoon. You’ll want to leave the pieces fairly large, and be careful not to mush them up. Stir gently directly into your pico de gallo. 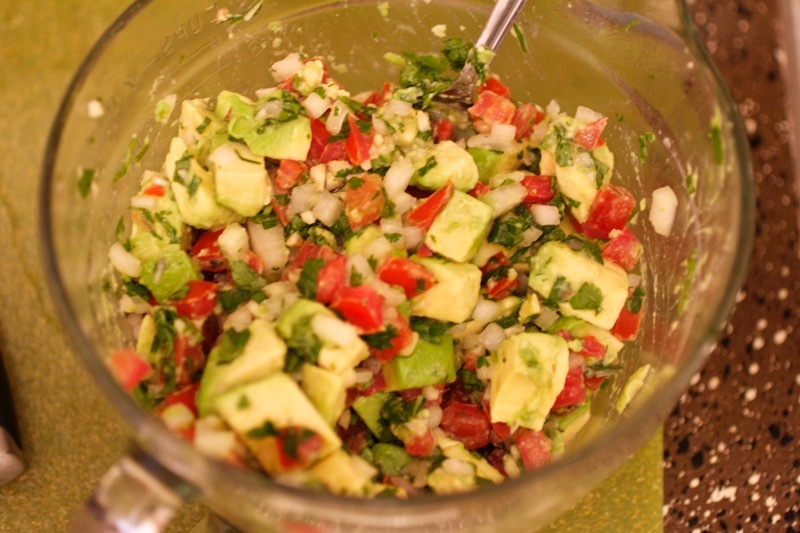 Make sure you’ve added enough lime juice to both be tasty, and keep your avocado from browning. We like a lot, but you’ll be tasting as you go, so go with your gut. Pop this bowl in the fridge and let those flavors meld together for a bit. Ideally you’ll want this to chill for at least a half an hour before you combine your final dish. Heat your sesame oil in a large frying pan. Maybe 2 tablespoons (we eyeball it). Toss in your edamame. You can buy this pre-shelled in the produce section of some grocery stores, or you can probably find it in the frozen section. We’ve done both, and I haven’t really noticed a difference using fresh as opposed to frozen. Today we’ve got frozen. The measurement on this one is vague, because again in our kitchen we usually just eyeball it. We’ve got about 1 1/2 cups today, and that’s what we’ll use. Let the beans cook for two minutes or so over medium high heat until they are nice and warm, and then toss in a few shakes of soy sauce – about 1-2 tablespoons (again, this is an eyeball it and taste it recipe). 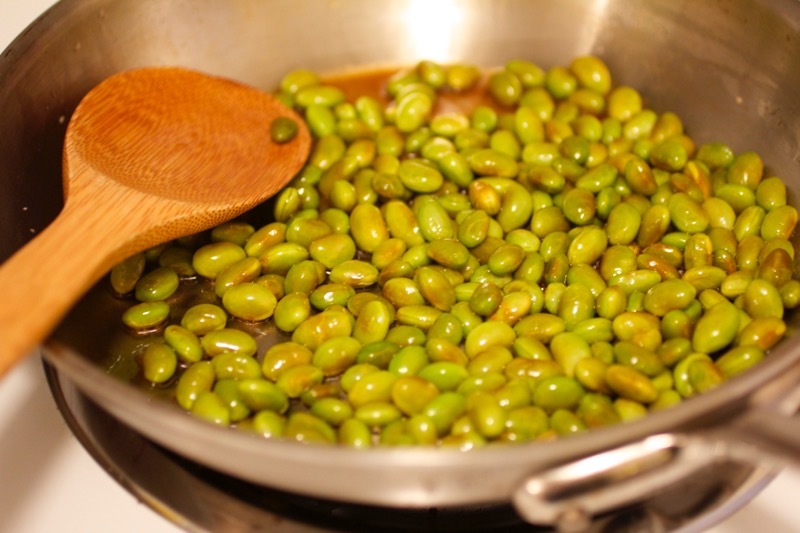 Sprinkle a few pinches of coarse salt over the edamame to taste. It actually sounds more complicated than it is. Just trust your tastebuds, and taste often! 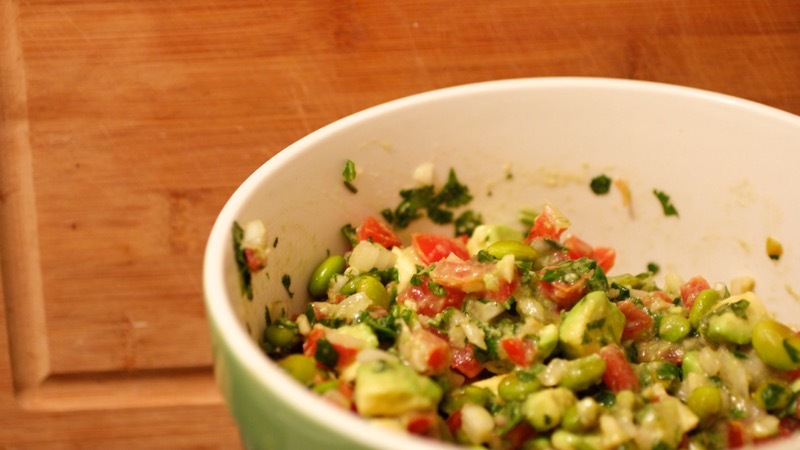 Take the hot edamame and stir it into the cold salsa/guacamole mixture. 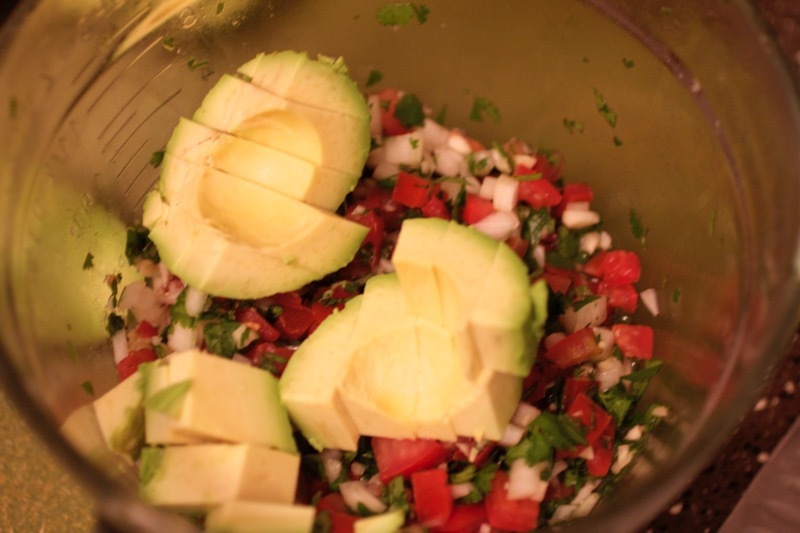 Being gentle still (you don’t want to break up those avocados too much) get everything thoroughly combine. Now, shovel into your mouth with whatever you have available! We like it with corn chips, but it would make an awesome topper for crostini or even water crackers. Heck, I’ve seen it eaten with a spoon before. However you enjoy it, make sure you’ve made enough for everyone else to enjoy too – it goes quickly. There you have it – a unique combination of flavors that is simple, and simply delicious!